Situé dans un endroit exposé entre Sineu et Ariany, ravi la propriété nouvellement construite sur un grand terrain 16000qm non seulement par sa vue panoramique sur la Serra de Levante jusqu'à la Tramontane. De plain-pied à convaincre le grand salon de bon goût et salle à manger avec SAT.- TV, ainsi que la grande cuisine entièrement équipée avec buanderie attenante. 1 chambre double avec accès à la terrasse et une salle de bains avec douche de plain-pied complètent l'espace à ce niveau. la galerie avec coin nuit et une salle de bain avec baignoire. Détendez-vous dans le bain à remous, piscine à débordement ou sur la terrasse avec un Barbacoa et profiter de la vue magnifique. Piscine: 9,80m x 3,80m. Profondeur: 0,90 m - 1,80 m. Jacuzzi: 2,80m x 2,40m. Le chlore. 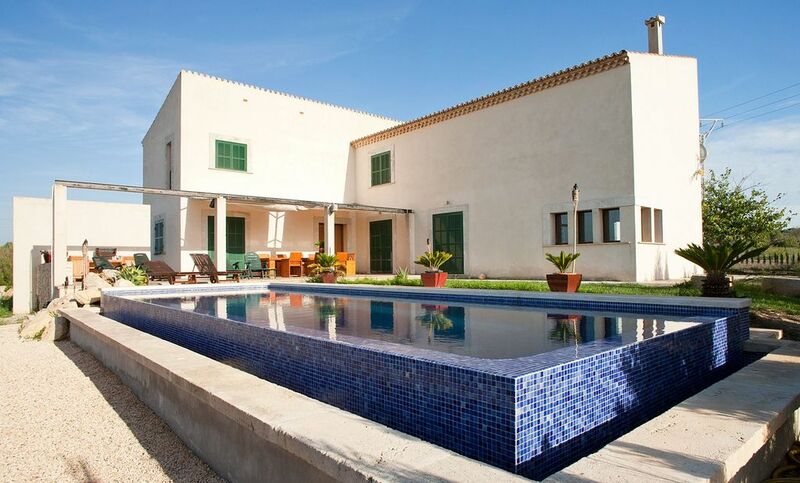 Lovely, large villa with a fabulous pool and outdoor area. Perfect for lots of people staying together and looking to maximise on alfresco dining! The owner Marti was incredibly responsive throughout our stay. – A few broken items (a light switch coming off the wall, kitchen doors not closing and the fridge outer door had completely come off.) However, this really didn't impact our day-to-day and the owner was very apologetic and acknowledged problems on our arrival. – The fridge and freezer both stopped working halfway through the stay. The freezer melted our ice cream which was a shame but the owner was very responsive when we raised the issue and provided a replacement fridge as soon as he could. – The television, despite having cable and claiming to hold 400+ channels, was only tuned to about 20. The rest were scrambled! Bit annoying but in no way a deal breaker. It was more frustrating testing each channel by trial and error. Other than that, we had a lovely holiday in a brilliant villa. The pool was fab – we made good use of it every day and the late check-out meant we could cram in a few more lengths before our flight! Yes, you can see that the property is ageing and that's to be expected, but it's still a great base for a stay in Mallorca. Particularly with its central location and being within 30 – 40 minutes drive of most major tourist spots. Not to mention, only down the road from some great supermarkets! Would definitely recommend this property, but perhaps advise those little glitches get ironed out to make it a truly relaxing stay. Géographiquement situé presque exactement au centre de l'île de la ville idyllique de Sineu, dont le nom est principalement associée avec le bétail traditionnelle foire, qui a lieu chaque mercredi ici. La petite ville avec une longue histoire offre d'innombrables monuments, minoteries historiques, manoirs, un itinéraire religieux, un itinéraire anthropologique et bien plus encore. Der Stromverbrauch wird separat mit 25 cent/kWh berechnet und vor Ort bezahlt. Die Kurtaxe ist am Ankunftstag fällig.. Vor Ort ist eine Kaution in Höhe von 300 Euro zu entrichten, die Sie am Ende Ihrer Reise erstattet bekommen.